snail also be found eating the chalk off rock for provide the protein which needed for their shells. The opening of the snail shell is covered with a slimy gel that prevents much air passage. Snails are mostly nocturnal, so that the light of day not burn them out as badly. Because they are hermaphrodites, they don’t need to worry about finding a mate in the dry air. A snails habitat usually consists of on land or in water depending on the type of snail. Snails are not usually in need of perfect environments because snails carry their homes and place of safety on their backs. Desert snails can sense when the air is particularly dry, and will burrow underground in order to retain moisture. Where, they can hibernate up to 3 years, waiting for the temperature to become more suitable for them. The average age of snail is 15 years. 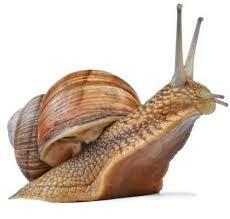 Another common question people ask about snails is, how is it that a snail can move? Snails have something like a flat foot located on the bottom side of their slime like body’s. There are muscles within the “foot” that are constantly contracting and expanding to create movement. It is actually the foot that creates the slippery trail commonly seen with snails; it is a special gland that excretes the slime which hardens when it comes in contact with air.